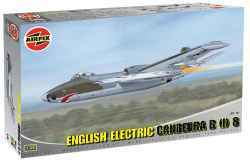 Detailed kit from Airfix of the English Electric Canberra B(I)8. The B (I) 8 was the interdictor version of the classic jet bomber & differed in that it had a raised fighter style cockpit. The B(I)8 was introduced to fill the role of a night-intruder bomber/interdictor flying low-level missions in the European theatre. 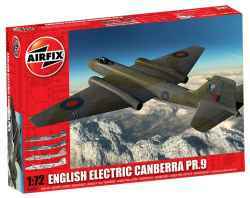 In the bomber role, the B(I)8 only served with the RAF's Strike Squadrons in Germany. 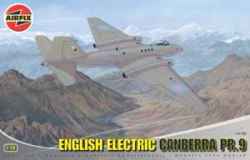 In its bomber configuration, this Canberra mark was part of the UK's Nuclear Strike Force and carried a US made weapon (Project E). B(I)8, 16 Squadron, Laarbruch, RAF Germany, 1972. B(I)12, 14 Squadron, Ohakea, RNZAF, 1968. B(I)12, 12 Squadron, Waterkloof, South African Air Force, 1975.